SANS SERIF: Tip of the Spear | Innovation, Inspiration... Atlas Unleashed! If magic were real, what you could do with it would be beyond belief, limited only by your imagination. You would be all-powerful. But what if you could use it to alter the geo-political landscape? What if you could topple governments and regimes and assassinate heads of state with it? What if you could spread propaganda and disinformation more effectively with magic than you could using deceit and subterfuge? What does a spymaster gain by using magic, and what does he lose? Spend a moment thinking about that. The possibilities are frightening, aren’t they? I attempt to answer those questions in my new series, TIP OF THE SPEAR, to be published right here at Atlas Unleashed. It is the story of Maximillian Cortés, a spy for the United States Government whose mission is to guard against mystical threats to national security. Max belongs to an ages-old order of beings known as Adepts, practitioners of sorcery and witchcraft that would have been burned at the stake hundreds of years ago. In the modern, post-9/11 era, magick, as it is referred to by Adepts, is much more sophisticated and virulent, and the reality of its existence and its usage much more clandestine. Cortés works for the Umbra, a super-secret agency run by Adepts of such power, with the true nature of their overall mission known only to a handful of VIPs within America’s political hierarchy. Max Cortés is a tortured soul with a broken past, knowing that, unchecked, he is capable of being his own Weapon of Mass Destruction, and yet he is the best defense against the enemies lurking in the darkness who are just like him, or worse. America’s Shadow War gets a whole lot darker in TIP OF THE SPEAR. Nothing is as it seems. 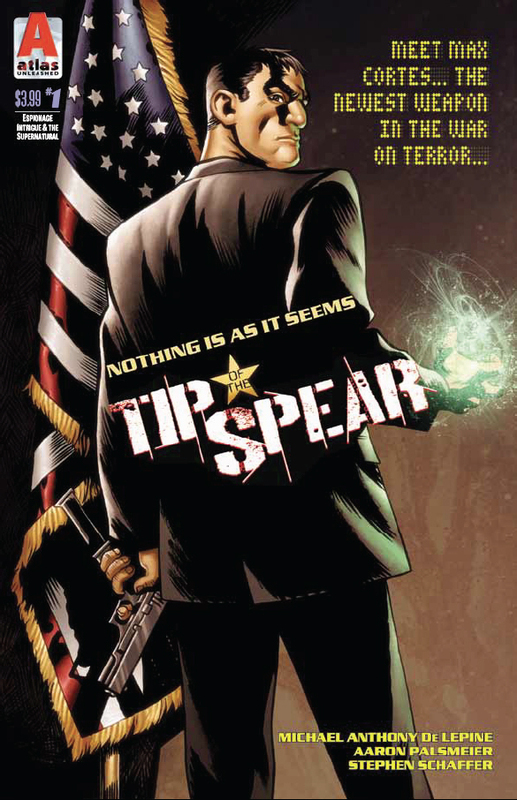 The world of TIP OF THE SPEAR, a world in which the intrigue and action of the best Tom Clancy thrillers mixes with the weird supernatural elements of comics such as DC’s CONSTANTINE, had been incubating in my head for some time now prior to taking root at Atlas Unleashed. With the help of artist Aaron Palsmeier (see the above art promo), a fantastic young draftsman who I predict will be going places in this industry, the amazing color palette of Stephen Schaffer, and the guiding hand of editor Mark Mazz, the adventures of Adept and spy Max Cortés can now be declassified. TIP OF THE SPEAR will be a feature in our new anthology comic officially entitled ATLAS UNLEASHED ADVENTURE #1, a flip book comic that also features another series launch in THE ALTERNATE ADVENTURES OF ANNABELLE AVERY, a turn-of-the-century steampunk series by writer Matt Kelly, artist Mike Gallagher, colorist Benjamin Glibert, letterer Nicole Powers and cover artist Bagus Hutomo. As a bonus feature, included in the first issue is a 4-page story about author and American institution Mark Twain, titled “EXPRESSIONS OF BULL-FROG WISDOM FROM THE LADY MISSISSIPPI.” It’s a tale whimsically written by Mark Mazz, masterfully illustrated by Chris Torres, and lettered by some guy named Mike De Lepine. Though it’s the flip cover of ATLAS UNLEASHED ADVENTURE #1, this image is actually a preview of things to come in TIP OF THE SPEAR #1, in which Max Cortés will be sent on a mission to Pakistan where he’ll be the only one standing between a U.S. Embassy under siege and an al-Qaeda Adept and his insurgent army. Cortés’ assignments will take him to many exotic locales in the grand tradition of Agent 007, and that mission will sure to be action-packed, so be on the lookout for it! When you pick up ATLAS UNLEASHED ADVENTURE #1, you’ll notice something a bit odd at first: the TIP OF THE SPEAR side of the issue is drawn horizontally, while the rest of the book on the flip side is traditionally vertical. There is a method to our madness, as this is being creatively deliberate. Every adventure of TIP OF THE SPEAR will be storytold in the opposite of the standard vertical comic book configuration on purpose. It is our hope at Atlas Unleashed that this new series be as memorable as possible in as many aspects as possible, including format as well as story and art content. Anyone remember John Byrne’s FANTASTIC FOUR #252? I sure do. The format change of that issue alone made the comic different and exciting. Not only that, look for future issues of TIP OF THE SPEAR to take on a double meaning as the title will be revealed to be a direct reference to Max Cortés’ ancestral heritage, and how he has been called to be what he is now. We believe that for this and so many more reasons, TIP OF THE SPEAR will be a series you’ll not soon forget. The ATLAS UNLEASHED ADVENTURE #1 flip book, featuring THE ALTERNATE ADVENTURES OF ANNABELLE AVERY and TIP OF THE SPEAR will debut at the 2014 New York ComicCon October 9th-12th at the Jacob Javits Center. Cover price is $3.99. For more information on the New York ComicCon, click their link below: www.newyorkcomiccon.com. 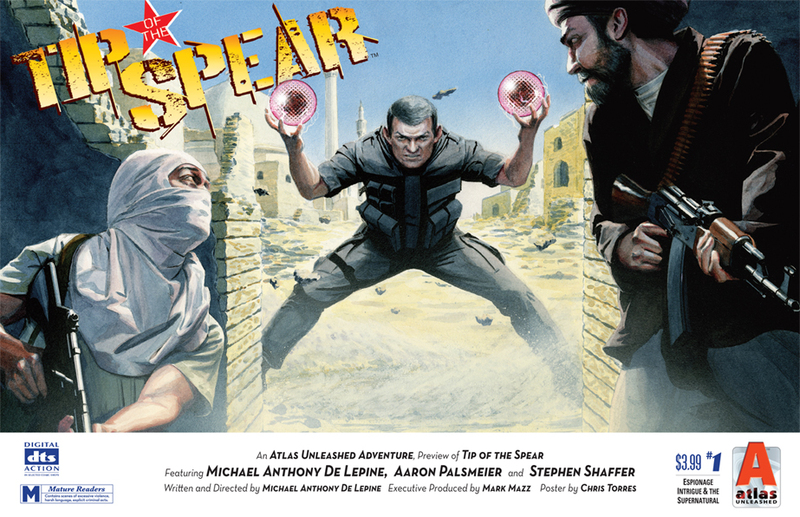 TIP OF THE SPEAR is brought to you by writer and letterer Michael Anthony De Lepine, artist Aaron Palsmeier, colorist Stephen Schaffer and editor Mark Mazz. P.S. : After NYCC I’ll do a blog post covering our role at that con, complete with photos and perhaps even some video clips! Until then, be good (and if you can’t be good, be sanitary)!